A recent result from research work being done on the continuum of parathainium (carrot grass) came out that a weed nut called Parthanium is not only affecting the health of the human or animal, but its impact is on pulses. Parthanium, able to grow with every season and every crop, has started influencing the process of increasing fertility by pulses crop production taken in crop rotation. Scientists believe that if this condition remains intact then it is certain that the crop cycle method will prove to be ineffective and the rate of pulses crop will also decrease. Agricultural scientists are explaining the root cause is allelopathic effect of Parthanium. During the investigation it has been found that due to Allopathic effect in which area of ​​Parthanium, few plants do not grow. But when the plants of Parthanium sprout through pulse crops, the bacteria found in the tumors of the pulp plant roots stop working. The production capacity of the resultant pulmonary plant decreases automatically. Apart from this, the bacteria found in the roots of pulmonary plants stop functioning and the likelihood of fertility of the farm also ends. It is noteworthy that after adopting a pulp cultivation after the normal crop and after that, the farmers of the fields are allowed to retain their crops due to the fertility of the fields. Since the bacteria found in the roots of the pulmonary plant are able to absorb nitrogen from the atmosphere, they also increase the fertile capacity of the soil. Now if these bacteria stop functioning then the crop cycle process adopted by the farmers will also become meaningless and the production of pulp crops will be reduced so differently. One-year-old carrot grass (Parthanium) plantation grows rapidly in places with moisture, besides, it also increases rapidly in open spaces and empty farms. The seeds produced from this plant are even dormant for a few hours, due to which the seeds of the seeds fall on the ground immediately after the germination process begins. The soil is of any kind, the climate is of any type, the growth of the Parthanium plant is not hampered. No insects attack on carrots grass (Parthanium), nor do they eat animals. If the Parthanium is not controlled during the time, then the day is not far when the production of pulses will decrease to negligible amount. Agricultural scientists say that this weed is not only contaminating pulses but also affecting the production of other varieties of crops, which can be controlled only by working only with mutual coordination and campaign vision. A plant of Parthanium weed produces seeds in thousands at one time and process of seed production in all seasons continues. Because the seeds are of light micro size, they are easily moved from place to place with air or water flows. Wherever these seeds get a favourable environment, they start growing. Parthanium plant completes the life cycle in these 4 months and completes 2 to 3 generations in a year. Every plant produces extremely subtle seeds from approximately 1500 to 2000, which have spread throughout the region with air and water. Parthanium is not only harmful to crop plants, but also proves harmful to humans and animals. The contact with this plant leads to allergic reaction. The skin diseases caused by this plant and pollen grains are also rarely treated. If the animals and birds eat it, they also suffer from the disease. Not only scientists, but farmers also have to work from the perspective of a campaign for control of Parthanium proving harmful for crops and individuals. When exposed to Parthanium, people get Dermatitis, eczema, allergies, fever and mother-related diseases. For long periods of time, living in Parthanium grazing places leads to swelling, face and throat blisters. When a plant is directly or indirectly immersed or emitted in the environment, it affects the other plant or damages it, then this action is called allopathy. Many plants emit or excrete many chemicals by roots in soil and other enrichment mediums. Many organic chemicals are produced due to the erosion of plant residues in the land. These substances change the enlargement of the same plant or other different types of plants by affecting their roots. In almost all plants, there are compounds responsible for allopathy, which are found mainly in leaves, stems and roots. 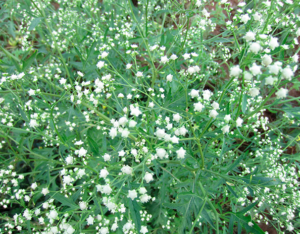 Block the growth of millets, cloves, corn, maize, jowar, cotton, gram, peanuts, sesame seeds, and seeds of lobhi and increase the growth of their nuclei to the aquatic acids of moth buds. Parthanium, which has taken the form of epidemic in the whole country, has also reduced the yield of crops by 40 per cent. In Parthanium, due to the detoxification of the toxic substance called cercatripean lactone, it is adversely affecting the growth and growth of crops. Not only this, its roots and pollen are also producing low and deformed production of vegetable and fruit production. 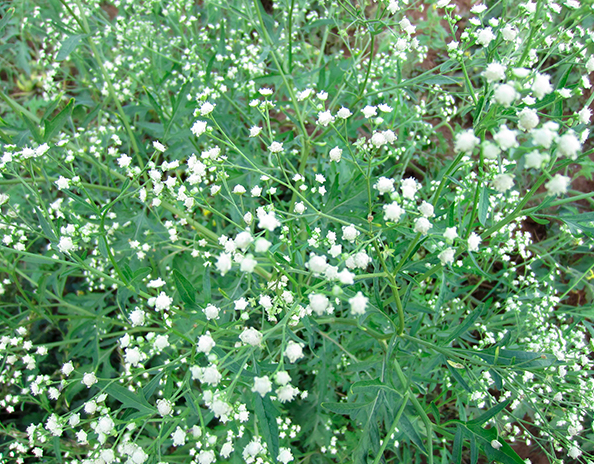 Parthenium hysterophorus, has achieved major weed status in India and Australia within the past few decades.